I took B’s words to heart and put on my (tight-fitting) running clothes prior to Matthew’s nap so I’d be ready. I laid with him until he fell asleep (just a couple of minutes – it gets easier and faster every day) and then I was out of there! I grabbed the monitor for Bryson and headed downstairs with my phone so I could stream some SVU on Net.fli.x. Of course the emergency “key” was missing from the treadmill so I had to track that down (thank you, Matthew, for bringing that upstairs a while back), but I found it quickly and I got all setup. I even stretched! I walked for one mile at 3.5 mph, then jogged for 2 miles at 4.0 mph (an admittedly light jog), and then finished with a 1 mile walk at 3.5 mph and a 3.5 incline. I moved my body (as Josey would say!) for 65 minutes and burned 432 calories. My average pace was 15:55 which is slow, but acceptable to someone who hasn’t run in over a year. More on this later! Let’s just say this little old treadmill was a bit rusty after no use for THREE years! She took care of me though…. Helped me quickly get back into it! Categories: Monday Snapshot, My Free Time, PAIL | Permalink. He may be sleeping well… But I’m not. 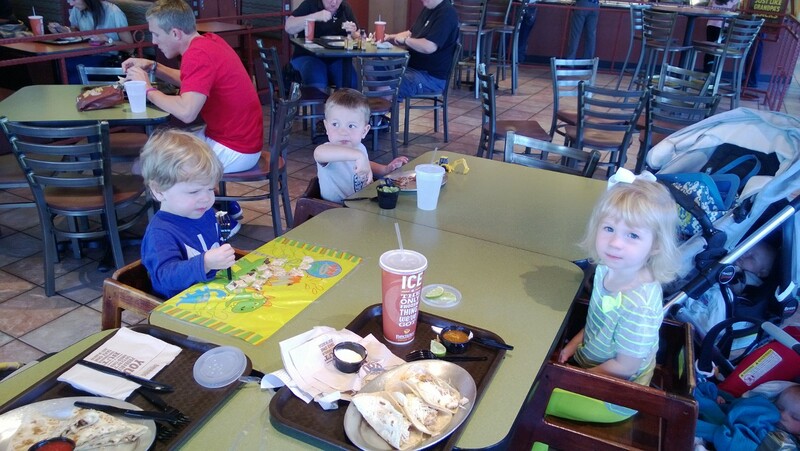 Wordless Wednesday – Preschool Lunch Date! Because the moms just can’t go home after school. There were cupcakes afterwards too! Categories: Food, Matthew, Wordless Wednesday | Permalink. When talking about activities for Christmas Day, she said, “Understand B that you, Courtney and the boys will be spending Christmas with Courtney’s family.” You, Courtney, and the boys. The boys. THE BOYS. Reading that made me smile… and it made me tear up instantly. That one little sentence made me think about the fact that my dream – our dream – came true. Sometimes, the pleasant reality of my life hits me when I least expect it. Sometimes, someone else’s words make me reflect on the life I’m living, and the people in it. Sometimes, I pause for a moment and cry a happy tear or two. Categories: Bryson, Family, Holidays, Matthew | Permalink. Starting a blog was something I wanted to do for a long time while going through infertility, but I didn’t have the time or the guts to do it. I did start a blog while I was pregnant with Matthew, but I never posted even one post, which made it very obvious to me that I just wasn’t ready yet. After Matthew was born, I struggled almost more with IF than I did while we were pregnant, and I’ll never know why. I think I felt terribly guilty, and I think I was surprised that I didn’t feel instantly better about our IF since we had a baby. I think that maybe I expected the sadness to just go away the minute I saw my son – but it didn’t. Even two years after he was born, a diminished version of that sadness remains. I always wondered what I would blog about if I did start a blog, and I quickly knew I wouldn’t be a typical “mommy blogger” (I do not like it when adults use the word, “mommy,” but I use it here because that’s what those bloggers call themselves). I couldn’t see parenting the same way those types of bloggers did, because the IF cloud still hung over me almost every day in some way or another – so I just didn’t blog. But when Elphaba started PAIL – I jumped on it immediately – and I’ve been blogging ever since. The only thing I wanted to achieve by blogging was the capturing of my emotions, thoughts, and images in one place for myself and for my family. That is still my goal every time I blog. I hope that some day, this blog will help my boys understand a little bit more about me – the me that they may not necessarily see as I’m running them to school and back, or tucking them in at night. I want them to know how it felt to be their mother. I want them to know that even once they were here, I wasn’t instantly healed of my sadness. I want them to see that emotions are real, in every form, and that they’re OK. I also want them to see just what I went through to teach them to sleep, or nap, or eat. HA! I have gained so much from blogging – it’s really been a great thing for me. B used to read my blog all the time, and said it gave him a new perspective on who I am and what goes through my head. He doesn’t read my blog often anymore, but when he does, he seems a bit more patient with me. 😉 I don’t think he had any idea how hard the IF was on me even after bringing home a happy, healthy, handsome baby. I have gained peace in our infertility, and I honestly don’t think I would be where I am today without my blog. I really needed a place to process my thoughts and feelings. When I say that I’m at peace with our IF, it’s not that I’m over it or forgetting it, but that I’ve accepted it for its role in my life and in my parenting. I know it’s always going to be there. I know that even when I KNOW my family is complete, that I’ll worry about how it affects our boys’ families. I’ll worry about how and when to tell their future wives about our fertility struggles. I’ll worry about how we’ll pay for their fertility treatments if they inherit MFI. These are things that aren’t going to go away, and I have a feeling I’ll blog about them in the future. I expected to blog my feelings and then work through them on my own. I did not expect to find a network of women who would work through them with me. That has been the greatest value in blogging that I’ve realized. I knew I wasn’t alone, but it’s been so nice to be told that I’m not alone. AND – I have made some great friends through blogging. When I first started blogging, I posted about my IRL friends being my community. Many of my URL friends have become my IRL friends whom I consider as some of my closest relationships. Back when I posted about my IRL friends, I never thought that the commenters on my blog would be folded into my community. I had no idea. But today, I rush Matthew to his nap so that I can get on Skype or FB to see who’s there, and to plan the next times we’ll see each other in person. Thank you all for being there, and for listening. Thank you for your friendship. What started out as a way to process my feelings and document them for my family turned into a way to connect with other women who had walked a similar path. Connections are good, and as I’ve realized, they’re REAL! Categories: Infertility, My Free Time, PAIL | Permalink.